Describes the OpenRAVE documentation system and all necessary function calls for generating and maintaining the documents. Meant for developers. Because documentation is uploaded to `http://www.openrave.org/docs/`_ , its HTML/CSS is managed by openrave.org system. doxygen version 1.8.2 or later is required. breathe is used for converting doxygen to python comments so that python users can be internal help for the C++ bindings. The breathe sources are in docs/breathe. reStructuredText for all other documentation. Most build files are stored in the docs/build directory. All images are saved into docs/images, including automatically generated ones. Because generation can take a long time, developers should execute the individual commands pertaining to the part of the system they are maintaining. The commands are given in the following sections. Compiling the python documentation is divided into several steps. # Take in the doxygen comments from the C++ API and creates python/bindings/docstrings.cpp, which is then compiled into the openravepy_int module. # Generate rst files from all the openravepy modules using sphinx-autopackage-script/generate_modules.py. # Generate rst files from the interfaces documentation and testing results. 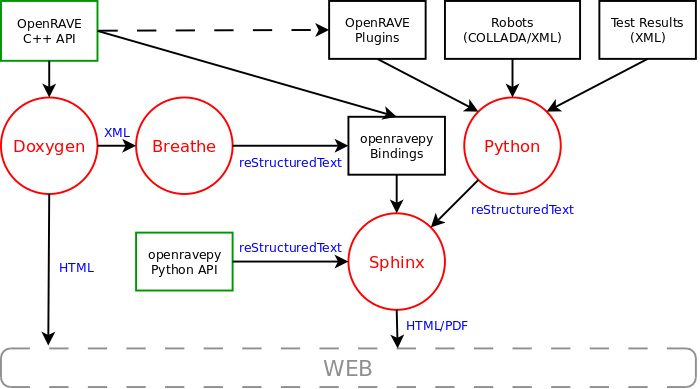 Because the documentation for openravepy is built from the install directory, whenever a change to the openravepy documentation made openrave has to be reinstalled with make install. The build/Doxyfile.html.en file is generated from Doxyfile.html and Doxyfile.en. The separation is necessary in order to provide better localization support for multiple languages. The mainpage and bulk of the documentation is in docs/mainpage.dox. Installation instructions are in docs/install.dox. Use the en, ja, ~ tags to switch between language modes. This outputs a set of reStructuredText files, which can be used by sphinx to build up the page. Generate a set of webpages for each robot using the statistics file output from test/test_ikfast.py. Use gettext internationalization to store separate translation files for each language Sphinx Internationalization, Japanese Tutorial. The translation PO files are stored in `https://openrave.svn.sourceforge.net/svnroot/openrave/trunk/docs/locale`_. Anyone is welcome to send diff files of translations. Note that both LANG and language have to be set.